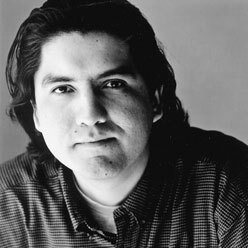 Shortly after the publication of his first book, The Business of Fancydancing—a collection of poetry and stories—Sherman Alexie was described as “one of the major lyric voices of our time” in the New York Times Book Review. He is the author of the novels Reservation Blues and Indian Killer; the story collections The Toughest Indian in the World and Ten Little Indians; and the award-winning screenplay for Smoke Signals, a film based on his highly acclaimed short-story collection The Lone Ranger and Tonto Fistfight in Heaven. He wrote and directed The Business of Fancydancing, a feature film. Alexie’s first young adult novel, The Absolutely True Diary of a Part-Time Indian, is forthcoming from Little, Brown. He lives in Seattle with his wife and two sons. Promotional postcard from "Word in Edgewise" the August 18, 2005 Conterbalance Salon. Signed by Sherman Alexie and Jess Walter.